A pleasant aroma wafting the room is probably the most enjoyable thing you can do while settling your house or your workplace. That’s why if you are to improve your ambient making it cosier and neater, an aromatherapy is a real catch for you. This device is an elegant aromatherapy portable diffuser. The mid-sized form makes the aromatherapy diffuser comfortable and convenient for any decor. What a feature is able make your home cosier? You should admit that it is a plant and, especially, wood. In fact, wood grain of this diffuser makes the device both stylish and homelike all in one. Due to its natural appearence your guests may think that it’s not a device but a kind of flower disk. Moreover, it can help you to move away from hustles of urban life. The best choise for lovers of eco-tradions. Choose an essential oil you want to breath and just add it into the tank. Then the moisture will be mixed with aromata and your space air will be filled with pleasant essence. It is a simple and comfartable way to create a special atmosphere you want. As modern ultrasonic technology allows to run without any noises, you can use it while working, having rest or sleeping without being disturbed with unwanted irritating buzz. You also have the possibility to choose a color among 7 LED light or make it cycle. So you may use it as a night lamp. Moreover, this is the diffuser with timer. Having only two buttons, the diffuser is easy to operate. Having wood grain coating the aroma humidifier looks cosy and eco-aesthetic. Due to its compact form you have have an opportunity to use it as a decorative feature both of your house and office. Moreover, it is easy to be uncaped so you will not be in for difficulties to take off its cap forcefully when your hands are damp. This oil diffuser can work for 10 hours when operated at continuous power capacity. It sustains 300ml of water and process 30 ml of mist per hour. Additionally, in case of water running out, it is switched off fully automatic that guarantee your security. The device covers up to 25-30 square meters, so it can be fitted in both a small bedroom and spacious office or yoga space. This is the LED oil diffuser having 7 adjustable colors, you have an opportunity choose soft or bright lighting and steady on or cycled through mode. It depends on your preferences whether you are to create a cheerful atmosphere with sober lighting or something romantic and relaxing. 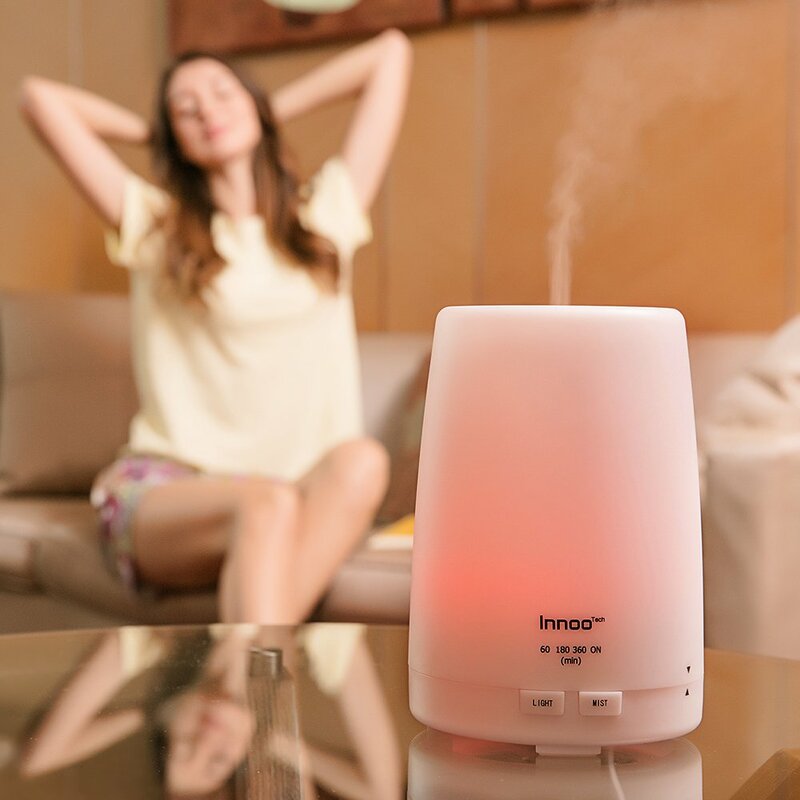 The aroma diffuser also allows to set time modes and you can switch it on to work during 1/3/6 hours or steady on. So if your life is busy, you can not worry about switching it off in time. You get 12-month warranty and free total service life technical support. This is an essential oil diffuser. Its classic design of wood grain gives the diffuser a lovely rustic appearance. Despite that the wood isn’t real, it looks very natural. Due to a big capacity (400 ml tank), you can use it for a long time without refilling. Adding some drops of the essential oil the devise diffuses a nutrient. As result, you are relaxing and relieving from stress. It’s really easy to regulate the atmosphere in your room depending on your wishes. Being equipped with ultrasonic technology, when running the mist oil diffuser is super quite. This technology is especially useful in wintertime since it also allows smooth moisture and helps to soften the dry skin. Moreover, the technology can improve your sleeping making the air more pleasant for breathing. Moreover, being an essential oil diffuser with light this device may be your nightlight (that is really benefit for people having fear of the dark). You can set a color among 7 LED lighting colors or make it changed one by one automatically. Some people would say that technology cannot look natural. But due to the elegant simplicity and the original wood trim, your guests may not even realize that this thing is an electronic device. Essential oil diffuser must, first of all, offer a pleasant relaxation. Therefore, it is designed so that a mere glance at it make you feel nice. This is a 8 hour working oil diffuser having a 400 ml tank. When the water runs out, the diffuser shuts off automatically to be protected from a damage that makes the device a really reliable and safe. It is a reasonable solution for a large room. As this oil diffuser has a stylish LED lighting with 7 colors, you have an opportunity to choose one in a steady mode or set it to be changed automatically. Due to this while creating a special atmosphere you may use the lighting as an addition to essential oil fragrance. The product includes a 45 days money-back and 12-month, worry-free Guarantee. This is a mid-sized aroma diffuser with light. It can be both a nice addition to your home atmosphere and a wonderful gift for a friend. The diffuser is compact enough to be fitted in your workplace, yoga class or any room of your house. The diffuser has an unusual zen-style look of wood natural wood grain. However, the material is plastic as water and wood cannot get along well during long time period. If you are busy, it will be comfortable for you to use an adjustable timer with operation modes of 1/3/6 hours or ever on. Having used an opportunity of timer, you may go about your business without thinking to switch the device off. But even if you don’t set the time mode, the oil diffuser will shut off by itself when the water runs out. 7 LED lights will defenetly have a stunning look in the dark. You may choose one color depending on your mood or make it cycle. It is an extremely quite diffuser. The purpose of any diffuser is to create a relaxing environment but continious buzzes would interfere. Anyway the operation of the whisper essential oil diffuser will not create noise pollution in your house. Choose an aroma you like and enjoy its diffusing with the help of the device. Sniff the diffuser fragranse, take the opportunity to moisten your skin and rest easy. The device has a look of sophistication. 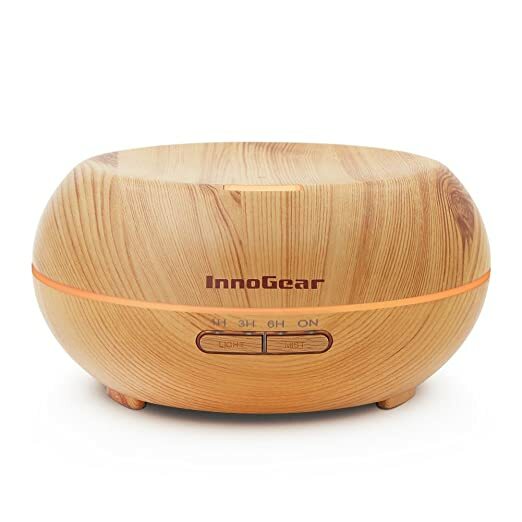 A gorgeous wood grain makes it a good essential oil diffuser suitable almost for any decor. Despite the fact that this diffuser is an electrical unit, it is pleasant to look at it as it was a plant or an adornment. It is considered to be a mid-sized oil diffuser. It holds up 200 ml of water, covers up to 250 square feet and works continiously during six hours. It is a sensible solution for a room with an average area. 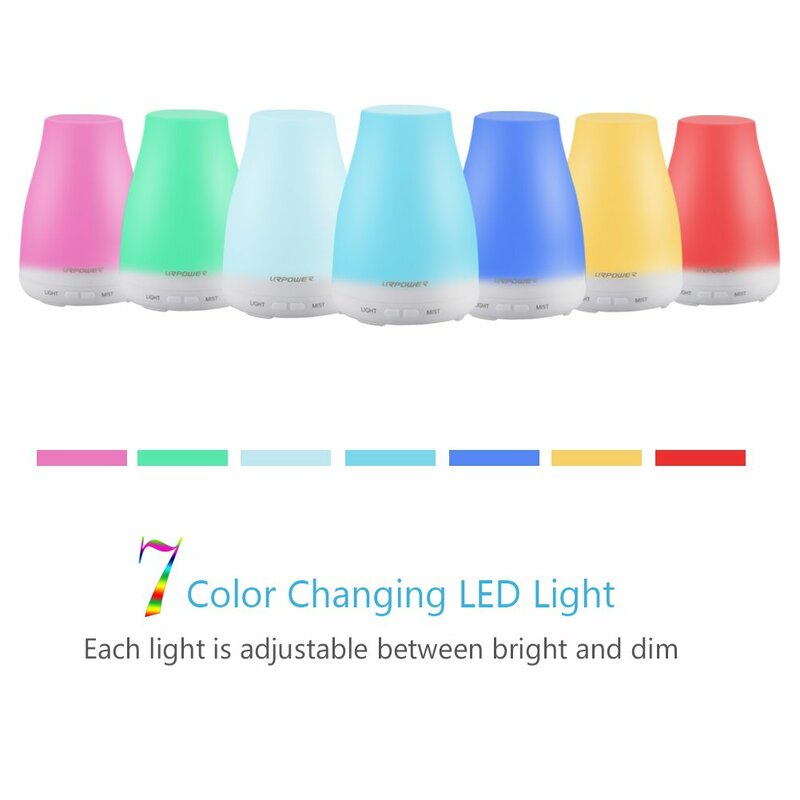 This is a LED oil diffuser with 7 colors. You have an opportunity to choose one color, make all colors rotating through or use it without lighting. You may also regulate the color light between bright and dim. It looks really nice in a low light room and creates a graceful atmosphere. Moreover, there are time setting modes:1Hr/ 3Hr/ 6Hr/ steady on. You can regulate it depending on what amount of time you need to use the air diffuser aromatherapy. When the water is over, it switches off automatically. You can regulate the duration of misting by pressing the “mist” button. You get a worry-free Guarantee. This whisper essential oil diffuser is an elegant choice for your workplace or home. The device looks like a presentible decoration of the room as it has an original appereance of the black wood grain vase. Your guests may even mistake the diffuser for a real vase. The adjustable timer will be an essential benefit for you if you are busy person or want to hold the key of everything. It has 1 hour/3 hours/6 hours/continious operation modes that help you to control the time of its operating and save energy expenses. Moreover, the oil diffuser is equipped with automatical shut-off system. When the water runs out, the diffuser switches off. So you can be not preoccupied with quantity of water in the unit. The diffuser also offers the opportunity to control the mist. Pressing the Mist button for several seconds, you can choose a strong mist with one beep or a weak one with two beeps. The aroma diffuser also has soothing mood-enhancing LED lights. You have an opportunity to choose one color among 7 ones and set it or make the lighting cycle the colors. It looks especially admirable in the dark and can be used as a nightlight. Using the essential oil diffuser, you will not suffer from irritating noises as loud as thunder. By the aid of the ultrasonic techonology, the device is super whisper-quiet. This aromatherapy diffuser is ideal way to have a rest after a hard working day and please yourself with calm relaxing environment sniffing the scent of health-giving oil fragrance. View of this oil diffuser is incredibly elegant. Its unique design creates the look of black wood grain vase. It has so natural appearance to the point that looking at this sophisticated device you may even have a mind to put flowers in it. The oil diffuser holds up to 400ml of water producing up to 30ml of moisture per hour. In the operation of continuous output it can work for 12 hours. This aroma diffuser has LED lighting with 7 colors. You may cycle them or freeze it on one fixed color in order to create a special atmosphere you want or match it with decor in your room. Moreover, you can also select the soft or brighter lighting pressing the button for 3 seconds. Depending on your wishes, you have an opportunity to choose an operation time using the timer from 1 hour/3 hours/6 hours/continious modes. You also shouldn’t bother to set it properly in order not to break the oil diffuser if the water runs out. Anyway, the device has the automatical shut-off function in case of water insufficiency. The mist is also selectable in a weak or strong mode. You get 45 days money back and 18-month worry-free guarantee. This essential oil diffuser creates the warm atmosphere not only with its operation but also with its view. Moreover, this unit has a low water safeguard. It is really easy to operate. Lift the lid. Fill the tank with water (for this purpose you may use a filling cup included in a package content). More or less depending on how strong you wish the fragrance would be, add several drops of the oil you want to pleasure. Cover the diffuser with a liquid, plug it in and switch on. The diffuser is designed in a manner that can be a decoration of the room. Having a wood grain it looks really cosy. But, of course, it is made of not wood but plastic, since the wood and water cannot fit together for a long time. Additionaly, the device has a convenient form and is perfect for small and medium rooms. The ultrasonic technology clears, humidifies and improves the quality of the room air. Especially, it is a benefit for health of people with dry skin or respiratory problems. Using the Mist button of the oil diffuser, you have an opportunity to make the mist weak or strong. You may also choose a time mode of the diffuser operation (1 hours/3 hours/6 hours/ever on). Furthemore, automatical shut-off system switches the oil diffuser off when the tank is about to be empty. That’s why, the device is completely safe. 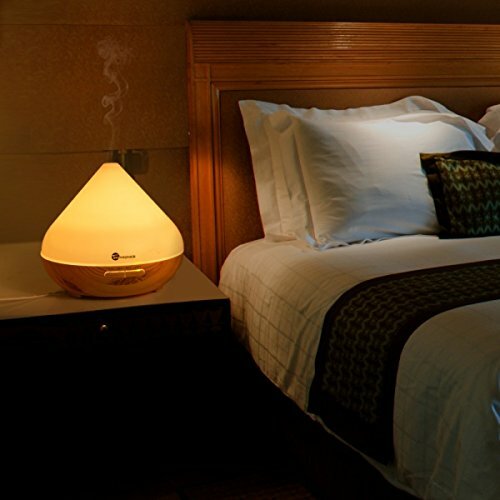 The aroma diffuser is not only a humidifier and a way to diffuse the oil into the air but can also be a bedlamp. It has 7 color LED lights with option of choosing one color or cycling it. This addition can surely be considered as a nice light therapy. With the help of this aroma diffuser you can pleasure the aromatherapy all day and night soothing your mood. It adds the moisture to the air, soothe your skin and bring joy with a pleasant fragrance. This essential oil diffuser can be a real zing for your house as it is designed in an elegant way with its wood grain. Even being switched off it creates a warm atmosphere in the place where it is set. The base has a lovely contour – it has four aromatherapy diffuser pads. That’s why the device is not flat on the table top. This aroma diffuser capasity is up to 300 ml of water. The device have an ability to operate for 8 hours in a continious mode. You can surely pleasure with color-changing glow of LED lighting. You have an opportunity to choose one color among 7 ones or make them to be changed one by one. It is an obvious benefit to be used at night as a unique fragrant bedlamp. Furthemore, the lighting is available in strong and soft options depending on your preferences. The timer will also be a bless for you. Using it you can set the time of diffuser operation in 1 hour/3 hours/6 hours/continious modes. When the oil diffuser detects low water, it will shut itself off automatically in order to protect both you and your device. That’s why it is really safe. Finally, you have an opportunity to control a stream of mist. You can choose a strong or soft mode by pressing the Mist button. You get 1 year warranty and 30 days money back guarantee. You also can use 24 hours email customer service response. This device is one of the best ranked oil diffusers having more reviews than most others. The model and the brand are fairly new but have already suceeded to find the appreciation among most customers. This oil diffuser is a scientific innovation and modern design in one form. Its lovely wood grain appereance is organic-looking, draw the eye and makes the diffuser a real decoration of your house or workplace. Moreover, due to its form and long power adapter with a cord reaching great distance the oil diffuser is portable and can be placed almost anywhere in your house. This is an essential oil cool mist diffuser. To creat a mist this device use not heat but vibrating sound waves. You may easy make sure in it passing your own hand through the cool mist the diffuser vapourizes. The 14 colors LED lighting cycles or you can stop on the color you wish pushing the Light button. It looks particulary incredible in the dark accompaning a special aromatherapy atmosphere. Hovewer, if you don’t want it to light, just choose a “no need to see amazing me” mode. You may set the time of operation in 1 hour/3 hours/6 hours modes. The mist is also adjustable and can be high or low. The oil diffuser switches off automaticaly when the tank is about to be empty. It is easy to clean this diffuser without any detergent. Unlike other models, this diffuser does not form any mold. One thing you need to do is to clean it once a week. The essential oil diffuser is adopted with a modern ultrasonic technology. That’s why when the device is operating, no disturbing noises will annoy you. The device quickly fills your house or workplace with a fragrance of the essential oil you have chosen. With the help of the diffuser you will not only create a fabuluous ambient filled with relaxing odor but also moisture the air. It is especially healing for people with respiratory problems and having a dry skin. The appeareance of the diffuser correspond to the name of its brand. The wood grain looks really zen style, its form is portable and comfortable. The essential oil diffuser tank can content up to 300 ml of water. It operates continuously for 10 hours only with a single fill. Its LED lighting includes even 14 colors that glow amazingly in the dark. You have an opportunity to set one color you wish, have the device fade through all ones or turn the lighting off. To choose the mode you should push the Light button. The ability to choose a time mode liberates you from incessantly checking the clock. Its timer can be set in 1 hour/3 hours/6 hours/continious modes. Additionally, you will not feel uncomfortable about the diffuser burning up. It is safe since has the automatical shut off technology which functions when the water tank is empty. You get 1 year money back guarantee. 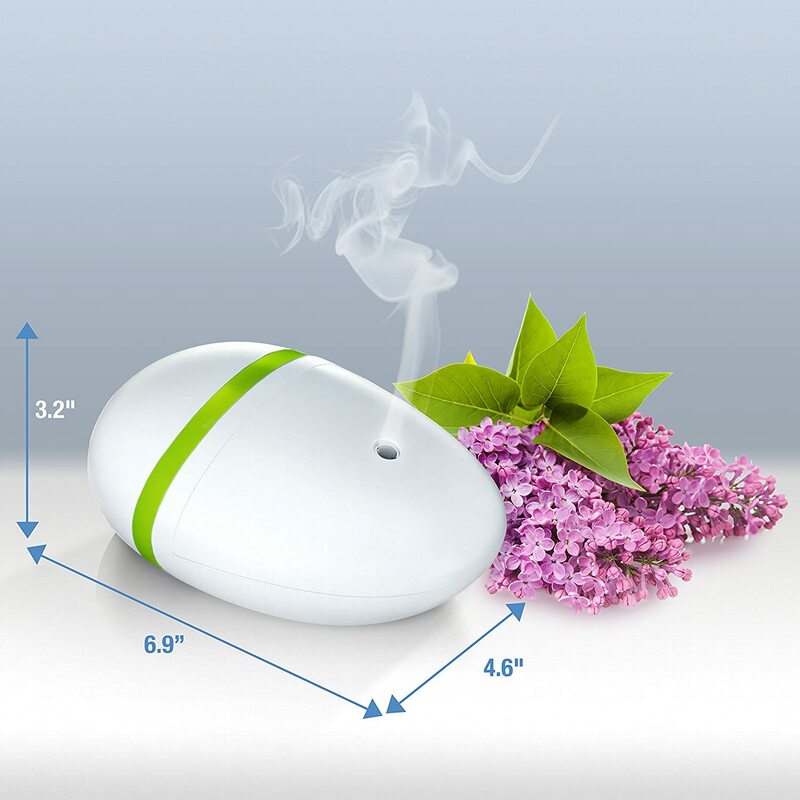 This is an ultrasonic aroma essential oil diffuser using modern technology without heating the mist. You can check it with your own hand and feel that the mist is cool. It is a convenient way to fill the air in your room with moisture and pleasant fragrance. Talking about its design, it is a mini essential oil diffuser being compact and elegant. You can place this device almost everywhere even in the room have a limited free area. 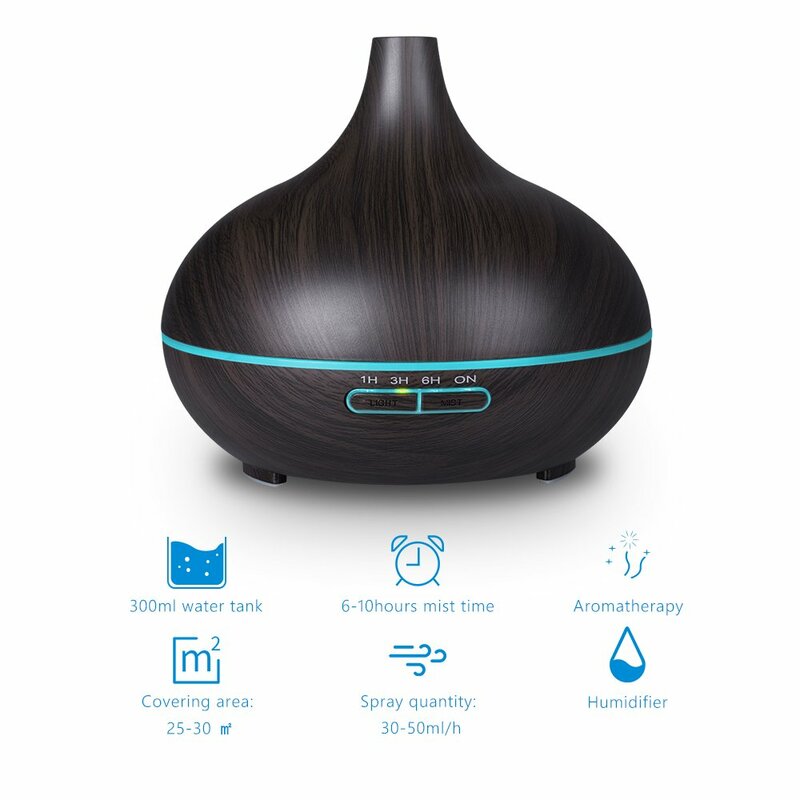 Compared to other models, this oil diffuser has a warning sound for low water level. Additionally, when waterless the device switches off automatically so it’s completely safe even if you forget to fill the tank with water. While creating a special atmosphere with this device the 7 color lamps will be handy. You can choose a color or intensity by yourself. The diffuser has also continuous and intermittent mist settings for your choice. With this cool mist diffuser you have an opportunity to calm the room environment. It adds moisture into the air and help to cope with problems of dry skin or breathing. Using this device you can enjoy enchanting fragrance that is especially pleasant after hard working day. You can purchase this affordable device for your friend or loved one. This oil diffuser has a stylish smart Japanese design, which prevents the device from tipping over. It is compact and portable enough to take with you travelling and will add a nice look to your room. Its tank can content up to 100 ml of water. Being mini oil diffuser it can be operated for 6 hours. You have an opportunity to choose a color of 7 color LED lighting and regulate its intensity or set it to cycle color after color pushing the Light button. You can also turh off the lighting as you wish. The mist is also adjustable. It has two modes: continuous and intermittent. This fragrance oil diffuser is considered to be a sensible solution when you look for a modern stylish device helping you to relieve the stress and proking the complete relaxation. It purifies and moisturizes the air by producing fine water droplets. Add several drops of your favorite oil and enjoy with its scent. Its desigh is unique and can be sutable almost for any interier. Looking like a little lovely rock or egg it is portable and easy to use. You can set this mini aroma diffuser almost at any place and take with you travelling without any difficulties. Being equipped with whisper-quiet technology it operates without uncomfortable buzzes. Therefore it will not bother you while being switched on. You have an opportunity to delight your eye with color changing hues of LED lighting. Have your favorite color on, rotate it or switch off, as you wish. It can change colors every few second like a string of christmas lights that a nice addition to any area wherever you place this aroma light diffuser. Another pleasant feature is an auto shut-off function. Delighting with an oil aromatherapy you can forget to switch the device off. So automatic diffuser will solve the problem for you turning off when the water and oil are used up. Cleaning aromatherapy diffuser you also don’t meet any problems. Just fill it with mild soap and water and wipe the device. This is an elegant little machine which will provoke your relaxation. You cannot burn hands accidentally touching this device while operation ast doesn’t use the heat. Produsing a soothing mist it is extremely useful especeally for people with dry skin. It is designed apealing and smart. The river pebble appearance makes the diffuser unique and a fine feature of any decor looking good to the eye. Its phorm is really comfortable so you can put it almost anywhere. Its reservoir contents up to 100 ml of water. The maximum operational time is 5 hours. This oil diffuser have an ability to cover 250 sq. ft.
You may set a mode of gentle color LED lighting. Choose a color you wish and freeze it or make it change one after one. 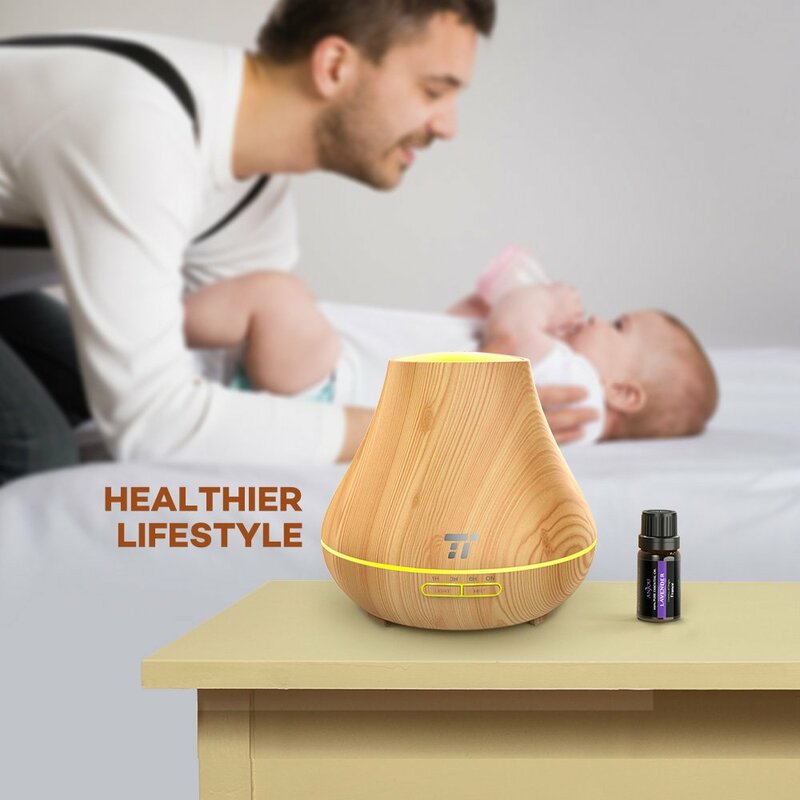 This multifunctional essential oil diffuser includes therapeutic effects of cool mist saturated with oil and soothing effect of watching changing colors long-life LED lights. This model allows you to discover a smooth wood grain design that gives you an extra peace of mind by simply looking at it. You may enjoy a timeless piece. This appearance will look suitable to your wooden furniture or any decor you place in. The oil diffuser is made of the same material as baby bottle – the polypropylene. It will withstand any corrosion no matter what essential oil you use with. It has no fan to create a noise when you have a rest. Being equipped with whisper-quiet technology it operates without uncomfortable buzzes. Therefore it will not bother you while being switched on. Admire a LED that browses 7 soothing light colors to better match your mood. The build-in cover diffuses a softer illumination that will ease tension and stress but won’t keep you awake. Colors are adjustable. Being an oil diffuser for large room, it can content 400 ml of water. You may use distilled water and do not clean the device or tap one and clean it with warm soapy water. The essential oil diffuser has two mist modes: continuous and intermittent. It is also equipped with low water build-in protection: when the oil and water are over, the device switches off. So you shouldn’t worry and control the time of its operation. This is a large essential oil diffuser having an elegant design. Natural appearance of the lovely wood grain appeals the eye and can be an excellent decoration of your home or workplace. However, the wood wouldn’t be a reasonable material for such unit, that’s why the aromatherapy diffuser is made of anticorrosion polypropylene build (the same material of baby bottles). Have more of a choice over the air around you with high- or low- misting to choose from. Comparing to previous models, you have an opportunity to get up to 14 hours of purified and better air with a superior 400 ml capacity. You have an opportunity to choose one of the 7 light colors to pleasure with or set in cycling mode. If you don’t wish it to beam, you can also turn the lighting off. The mist is also regulated. Pushing the Mist button, choose an operation time: 1h/3h/6h. Then you may set the low and high mist mode. Additionally, by the aid of smart timer you can keep your mind in peace: the unit shuts off automatically when the water and oil are used up. It turns quitly without any beeping noises. This large area scent diffuser can be applied both as the bedlamp and the humidifier. 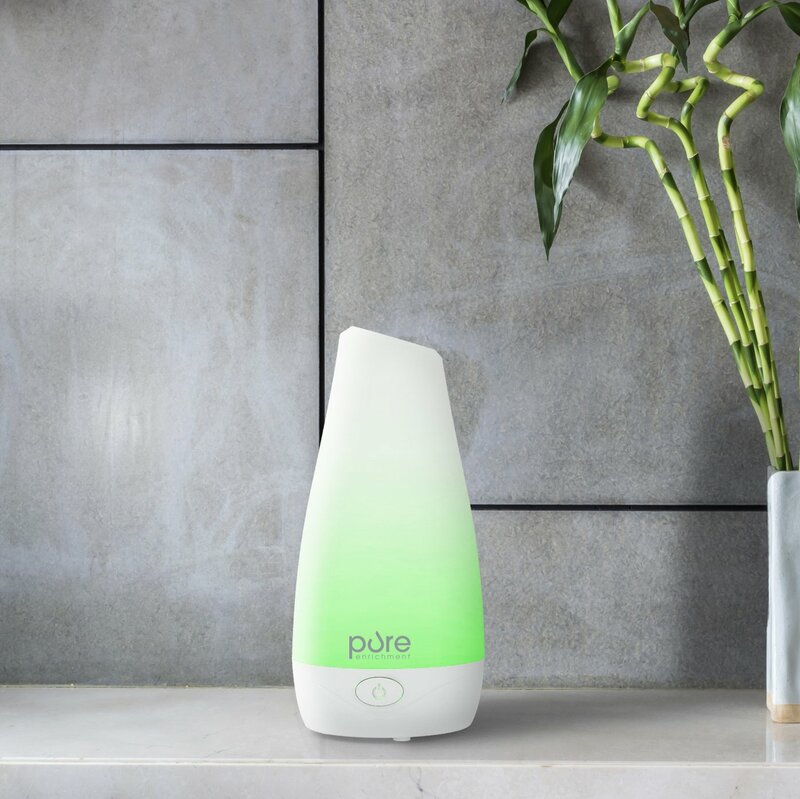 The essential oils you will add to this device increase the purifying effect as it can help in killing bacteria and fungus in the air. With ultrasonic vibration, the water is atomized into water molecules that distributed into the air uniformly to keep the air humidity, thus preventing the loss of skin moisture and moisturizing effect. Being equipped with whisper-quiet technology it operates without uncomfortable buzzes. Therefore it will not bother you while being switched on. You will hear only the soft whirr. The tear-shaped diffuser has a stylish design. Having 7 colors LED it has awesome color changing mode. Of course, you can choose one color to be lit as you wish. Anyway, the device is a nice way to cope with your children nightmares using it as a bedlamp. The essential oil diffuser also has a new fan technology implemented. The new fan circulates the mist around the larger space. It also doesn’t heat the air, so you shouldn’t worry about burning with the device accidentally. Its mist is cool as well as the diffuser. In addition to the oil diffuser you get an Innoo Tech cleaning brush. By scanning the barcode in the card of “thank you” you can download aromatherapy e-books to read about oils and their healing effects on the human health. With the oil diffuser you have an opportunity to moirturize the room air during any time of the year. Moreover, it diffuses the mist without heating it so saves the integrity of the oil. As a result, you may pleasure with its full aromatherapy effect. The diffuser has a tear-shaped form and will become an elegant decoration of your room, especially in case of using its rainbow LED lighting. It really appeals to the eye. 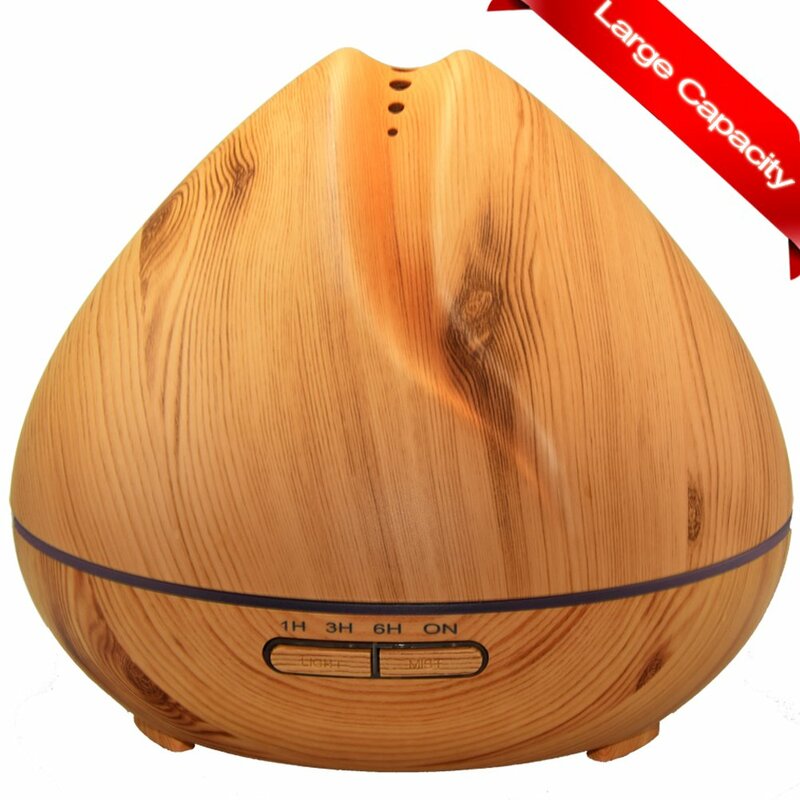 The aromatherapy diffuser has a large capacity that’s why the unit can be used in large rooms and for a long time. It has a 300 ml tank and releases the 35-50 ml of mist per hour around the 30 square meters. Enjoying the 7 color LED you may regulate the modes of lighting. Choose the color you want to shine or make all 7 colors alternate on their own pushing the Light button. Every color has a dim and bright version at option for your pleasure. Obviously, if the light disturbes you, just switch it off. The oil diffuser is equipped with a timer. Choose 60/180/360 minutes or just an “on” mode for continious mist. Fortunately, it shuts off after the water is over in the tank. So you can keep yout mind at ease. A 45-day money-back guarantee and a 18 months warranty are provided. This is a small diffuser for essential oil. It has marvelous exotic eco-friendly design of zen style. Its appearance isn’t showy and pretentious but has a restful effect. The bamboo wood grain looks really natural and delights the eye. The diffuser is also portable enough to take with you while travelling. It is a smart choice for your home, workplace, massage or physical therapist studio. It is easy to use this device. Remove the top and fill it with 160 ml of distilled or tap water. Then add some drops of the essential oil you wish and cap it. Switch the diffuser on and in no time all unpleasant odors will be replaced by your special fragrance. All that is left to do is to enjoy and relax sniffing the scent of your favorite oil. Due to whisper quite operation, the diffuser makes no noise, so your kids will not be kept awake all night. It is amazing unit to give you a peaceful night’s sleep. Furthemore, it doesn’t have any beeping noises while you push the button. If you wish to create a unique atmosphere, light up your life with 7 changing long-life LED. Change the colors manually among 7 ones or make them cycle optionally. Try it, the beam is really hypnotizing. You have an opportunity to control the mist. Choose between a continuous steady stream of mist or a misting at 10 second intervals. The timer is also handy to regulate the operation time. To all intents and purposes aromatherapy diffuser helps you calm down after grotty day. Its cool mist smells clean and fresh. Moreover, it is great for your hair and beneficial for dry skin, chapped lips, and mucous membranes in your nose. This small essential oil diffuser has a lovely cosy appereance. Its bamboo wood grain will add an increadable mark to your decor. 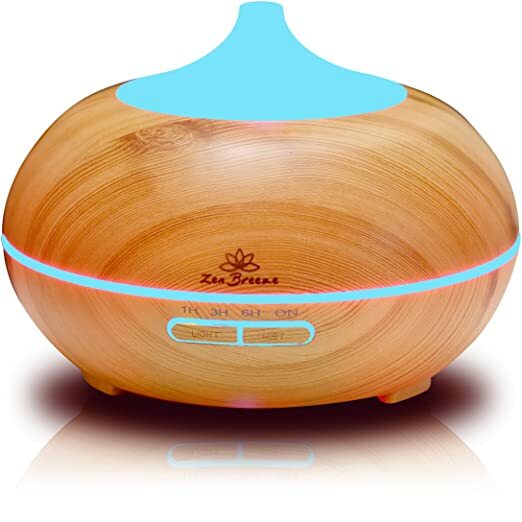 The zen style of this aromatherapy diffuser move you away from strained urban worries. Moreover, the beam of its LED lighting helps to create a pleasant environment for your relaxation. This is the small oil diffuser having the 160 ml tank. You have an opportunity to choose the color you prefer, set it alter one by one or make the diffuser lit without color. The timer is also really convenient thing. Wade your cares away withot niccessity to keep in memory to switch the diffuser off. The aromatherapy diffuser has time modes of the operation: 1 hour and 2 hours. Additionaly, you can control the stream of mist in continiuos and intermittent modes. Unknown information, you may be able to find warranty information on the manufacturer’s website. This is the small essential oil diffuser which may be set in any space. The stylish little thing adds the fresh and sweet mist saturated with your favorite oil to the common environment and creates a unique relaxation. You will surely be overwhelmed with its unique design perfectly fitting in any interior whether you place it in your cosy bedroom or the office of the considerable enterprise. 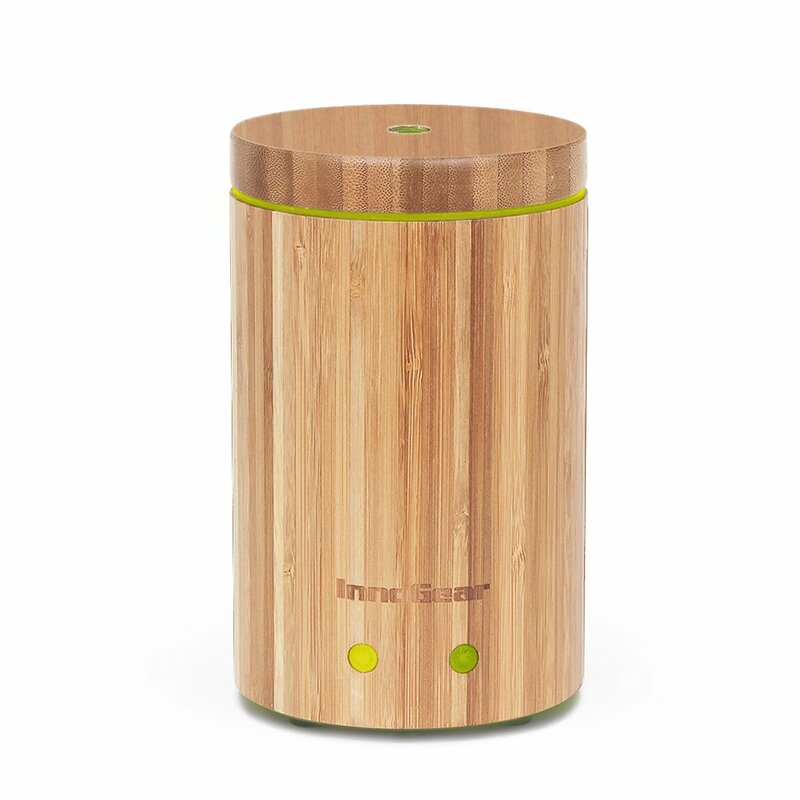 The size of this aroma diffuser humidifier makes it easy to be moved from room to another. If you have respiratory problems or dry skin, the unit is for you. It humidifies the air of your room and allows to breath the moist air. Of course, the main benefit of any diffuser is the fragrance. So if you add some drops of aroma oil, the moist air will be filled with any essential oil you choose. Furthemore, the unit will help you to replace all unpleasant stinky smells like pet or tobacco odours with smells you choose. Except the aromatherapy effect, the device easily can be used as a night light. It has LED mood light which can be turned on or off as you wish. This addition is perfect for people suffering from nightmares. Moreover, the diffuser is really quite, so no buzzing or beeping noises will not disturb you while operating or switching on/off. Mind your affairs and, perhaps, you will even forget about operation of the diffuser. However, even if you forget about the diffuser and as a result don’t switch it off when the water is used up, don’t worry. The device is totally safe being equipped with the auto shut-off system. This is also very comfortable bonus which helps to safe anergy and bills. 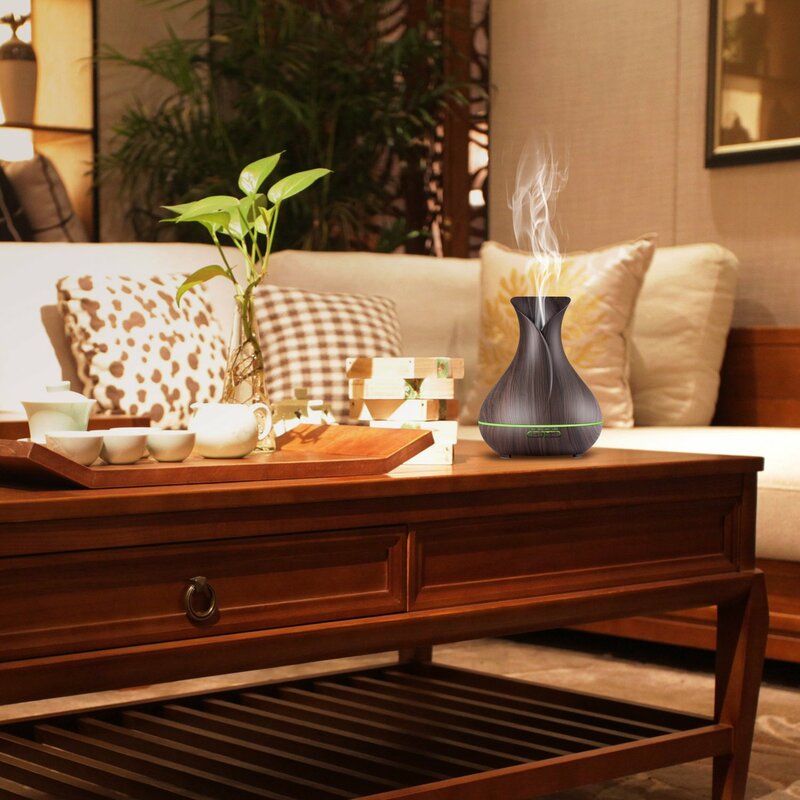 The smooth shape makes the essential oil diffuser a real decoration of your house. The smart design of the device is compact and pleases the eye. The PureSpa essential oil diffuser tank can consist 100 ml of water. Talking about the coverage area, it spreads the mist up to 250 sq meters. A rule of thumb states that this is the average area office. The light of the device is adjustable. Having 7 colors which may be relevant to different your moods the oil diffuser gives you an opportunity to choose the color. Addition to this, you may set it in continious mode or even switch the light off. 60-day money back guarantee from the manufacturer is provided.